With harvest season over and the cold creeping south, now is the time to start or evaluate your digital strategy. Do not wait for another year to pass and another year of improvements to be missed. Here are seven steps to establish your farming digital strategy. Assign responsibility. Some may say assign blame. However you look at it, someone must be responsible. Whether you are a single family operation or a large operation with many permanent staff, someone must be responsible to make the decision. Additionally, someone must do the required work. There are too many variables for a good digital strategy to simply evolve. Determine who is responsible for the decisions and who is responsible for the action. Evaluate your GPS enabled equipment. A good place to start is with your GPS-enabled equipment. What worked last year? What needs repairs? What equipment has become obsolete and should be replaced? Does your hardware talk with your preferred software? You can save time by working on hardware now before the field reps get backed up with service calls. Evaluate your data layers. There are many data layers available to growers, including but not limited to seeding Rx, “as-planted” data, soil sampling data, yield data, aerial imagery, weather data, and management zones. Take stock of your data layers. Which ones did you make decisions from? Which ones were not useful? Which ones will be useful in the future but you don’t currently have the time, knowledge, or equipment to leverage? Purposefully think about how you are gathering and using these data layers. Scrutinize your decision support software platforms. Software platforms have a way of sneaking onto your farm. What is its purpose of each platform you are using? How do they talk to each other? What holes do you have when you are trying to make a decision or take an action? Is the data in your DSS backed up and where? Can the data in your DSS survive a fire/flood/theft? Simplify, Simplify, Simplify. Complex solutions can create confusion and complications. Try to optimize the different types of software and hardware on your operation. Do not be afraid of new technology but be purposeful in what you bring onto the farm. Make improvements. I recommend to only fix a few things each year. If you make too many adjustments at one time, you won’t be able to determine which adjustment worked. Start by fixing the “low hanging fruit”. Evaluate your yield maps and determine if your VR scripts are optimized by looking at your check blocks. 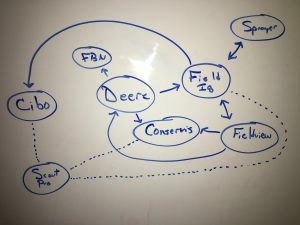 Are you “profit mapping?” This will tell you where to make improvements in the field. It is easier to increase ROI by fixing bad management practices than it is to grow 400 bushel corn. Grade your operations and then make quantitative improvements. Demand data excellence. Establish a requirement for all data and data sources be calibrated and of the highest quality. Uncalibrated or bad data will lead to bad decisions and skew your review next year. Do not allow bad datasets into your decision calculus. Demand data excellence from everyone on the team. This is not the only way to establish a digital strategy. But it is a way to make a digital strategy. Make a plan and then you will have a place to make adjustments from. As Yogi Berra is quoted as saying ““If you don’t know where you are going, you’ll end up someplace else.” Have an idea where you want to be with your digital strategy and work from there. And please, if you have ideas about creating a farming digital strategy, reach out to me at sjackman@deveronuas.com or on Twitter at @ssjackman.